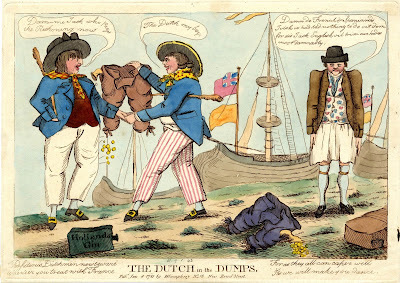 The Dutch in the Dumps, Hannah Humphrey, 1781, British Museum. 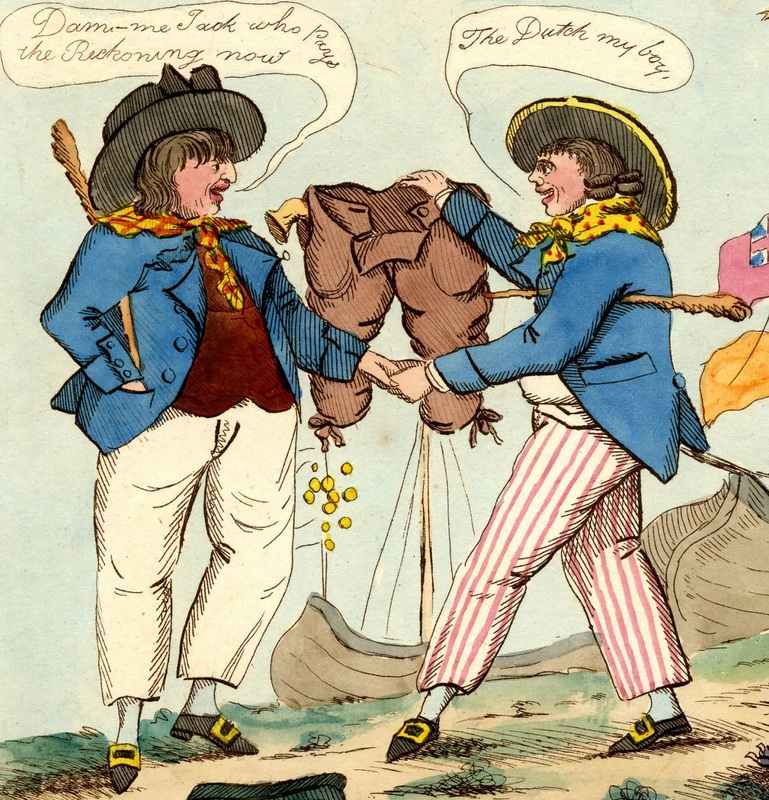 Early 1781 saw a few of these prints: English sailors jovially celebrating their recent victories over the Dutch. Not only is the Dutchman stripped of his breeches (and loudly lamenting having joined Spain, France, and America against Britain), but his ships have been taken, as evidenced by the British flags flying over the Dutch ensigns. The British sailors in the left foreground smile and shake hands as they pour gold from Dutch pockets. Both carry cudgels and wear blue short jackets that appear to be double vented with mariner's cuffs over turnback cuffs, and with waist pockets. Likewise, they both wear round hats, though one sports a large black bow, and the other yellow tape around the brim. The tar on the right has plain white trousers, a red waistcoat with a slight cutaway and flap pockets, and a plaid red and yellow neckcloth. His mate wears a yellow neckcloth dotted in red, a white waistcoat of a similar cut to his mate's, and red striped trousers.